Is This What the Pilgrims Had in Mind? This is Still America, Right? I was in a funk yesterday afternoon. Maybe because of that last second 109 yard touchdown Auburn made crushing my beloved Crimson Tide’s chances of another National Championship title. Maybe it was the 110 poinsettia I’ve been hocking the past couple of Sunday’s at Church for a mission fundraiser and people have quit making eye contact with me for fear they will have to buy one. Maybe it’s that while Thanksgiving is a holiday full of football, food and family, three of my favorite things, it’s also a reminder of empty seats around the table of loved ones gone on and ones that just stopped coming by. Whatever the reason, I was in a foul mood. Heck, I’d been in one off and on for the past several months. Life, seasons and people change and it seemed 2013 was a record-breaking year for change, some good and some just plain depressing. And so, while watching an especially moving Tyler Perry movie, I ate my feelings in the form of a Oreo. Not just regular Oreos. Double stuffed with a faint smear of peanut butter on top dunked in Purity’s Sweet acidophilus milk. My absolute favorite way to eat a Oreo. As I dunked the last one in milk (yes, I ate the whole darn bag), Tyler Perry’s main character sat in a Church service listening to a man preach about not growing weary. You know the verse, “And let us not be weary in well-doing: for in due season we shall reap, if we faint not.” Of course, the whole time the man of the cloth spoke the congregation was nodding, clapping and Amening while the choir hummed in the background. It was one of those scenes in just about every Tyler Perry movie where you want to jump up and take a lap around your living room shouting “Hallelujar”. I had always thought that the “let us not be weary” part meant if I was the Christian I claimed to be I wasn’t supposed to get tired. I wasn’t supposed to feel like I was at my wit’s end trying like hell not to throw in the towel, like all those Sunday mornings and Wednesday nights sitting on a Church pew had been in vain. If I had moments when I felt like giving up then something must be intrinsically wrong with me and my walk with Christ. Hearing this robed preacher from the Wheat Street Baptist Church tell his congregation that Jesus didn’t count it a sin to get tired gave me hope. Jesus had given me permission to get tired. Just because I get tired at times and question what this is really all about isn’t the crime here. 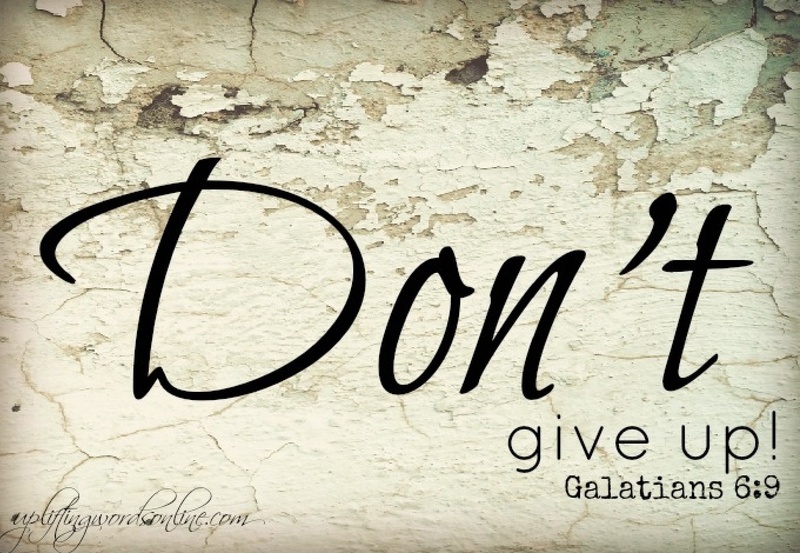 Choosing to give up is and, I sure wasn’t ready to throw in the towel just yet. Yesterday, I ate my feelings and surprisingly enough, they didn’t even taste that good. Oreos not taste that good. Somebody call the doctor. I must be sick. Galatians 6:9 And let us not be weary in well-doing: for in due season we shall reap, if we faint not. Umm, that preacher was on the mark. If I gave up every time I grew weary I would be spending most of my time just trying to catch up. When that “running around the living room” feeling hits that’s the catching up time. Just DO it. Thanks for your honesty and your presentation of it. Love you.